On February 3, Illinois Sixth District Republican Congressman Peter Roskam introduced a bill in the U.S. Congress that would defend Israel against any criticism from U.S. academics. Roskam is responding to the December, 2013 vote of the American Studies Association (ASA) to boycott Israeli academic institutions for their role in the illegal Israeli occupation of the West Bank and Gaza. The American people were told this day would come. 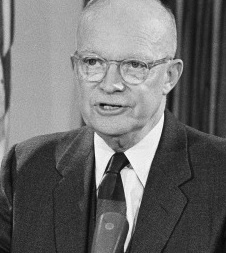 In his Farewell Address, delivered on January 17, 1961, U.S. President Dwight Eisenhower (above) warned the nation to guard against the “unwarranted influence” of “the military-industrial complex”. “In 1959 President Dwight Eisenhower began a dialogue with his brother, Milton, the president of Johns Hopkins University, regarding U.S. military policy. In the spring of 1961, a small group of undergraduates met with Milton Eisenhower to discuss the president’s farewell address. Eisenhower informed us that he and a John Hopkins professor of political science , Michael Moos, played major roles in the drafting and editing of the farewell speech of January 1961″. That misplaced” power takes many forms. The bill Congressman Roskam presented to the Congress is a direct attack on the freedom of speech. The bill proposes to “amend the Higher Education Act of 1965 to prohibit an institution that participates in a boycott of Israeli academic institutions or scholars from being eligible for certain funds under that Act”. Roskam calls his bill the “Protect Academic Freedom Act”, an oxymoronic title which contradicts itself by making it illegal for members of the academic community to exercise their academic freedom. In contrast to Congressman Roskam’s subservience to Israel’s demands, a Jewish Member of England’s Parliament, Sir Gerald Kaufman (left), told the Parliament, “we must impose sanctions”. On February 5, Kaufman spoke during a debate in the British Parliament on the humanitarian situation in Gaza. “I once led a delegation of 60 parliamentarians from 13 European parliaments to Gaza. I could no longer do that today because Gaza is practically inaccessible. The Israelis try to lay the responsibility on the Egyptians, but although the Egyptians’ closing of the tunnels has caused great hardship, it is the Israelis who have imposed the blockade and are the occupying power. Roskam’s bill was routinely referred to a committee, where it will no doubt linger long enough to gather the usual Zionist loyalists to add their names to the bill and curry favor with the likes of AIPAC. Chances of passage are nil. Proposed bills like this one are not meant to be; they are meant to send a message. Ali Abunimah reports that Congressman Roskam got the idea for his bill/message from Israel’s former ambassador to the United States, Michael Oren, who made the suggestion a few weeks ago. Former Ambassador Oren was once a U.S. citizen, a designation he gave up to become an Israeli citizen, a requirement for him to become an Israeli ambassador. The symbiotic relationship between the U.S. and Israel is especially close in diplomatic interaction between the two nations. Martin Indyk, for example, John Kerry’s current mediator in peace talks between Israel and Palestine, was born to Jewish parents in England. He was raised and educated in Australia before he moved to the U.S. and became a citizen. Subsequently he was named U.S. ambassador to Israel. Today he never leaves Kerry’s side as they struggle through the negotiations morass. Making Kerry’s job more difficult, the U.S. Congress provides legislative support for Israel whenever Israel and its American lobbyists determine it is needed. After the ASA December vote, the Israel Lobby wanted action. Prodded by Ambassador Oren, Congressman Roskam rushed to Israel’s rescue. The bill proposed by Roskam “would deny federal funding to any institution that participates in a boycott of Israeli universities or scholars or even whose departments issue statements in support of a boycott”. Meanwhile, as Congress defends Israel at every opportunity, the Boycott, Divestment, Sanctions (BDS) movement is gaining momentum, especially in Europe. The British Economist reported this week that BDS is turning “mainstream”, reaching into power circles that were once assumed to be immune to boycott pressure. Some European pension funds have withdrawn investments; some large corporations have cancelled contracts. . . BDS has begun to grab the attention of some of the world’s largest financial institutions. PGGM, a big Dutch pension fund, has liquidated its holdings in five Israeli banks (though the Netherlands’ largest has affirmed its investments). Norway’s finance ministry has announced that it is excluding Africa Israel Investments and its subsidiary, Danya Cebus, a big building firm, from a government pension fund.
. . . Romania has forbidden its citizens from working for companies in the West Bank. More churches are backing BDS. An American academic association is boycotting Israeli lecturers. The debate turned viral after Scarlett Johansson, a Hollywood actor, quit her role as ambassador for Oxfam, a charity based in Britain, in order to keep her advertising contract with SodaStream. Throughout his book, Goodman adds “congressional” to the “military-industrial-complex”, an acknowledgement that President Eisenhower had initially had “congressional” in his thinking. The former president was very much aware of legislative power in the “military-industrial” complex. He knew this from his own experience as Supreme Commander of the Allied forces in the invasion of Europe in World War II, and of his dealings with Congress during his eight years in office as president. The following video of Congressman Roskam illustrates the influence of the “military-industrial-congressional” complex on the U.S. government. This is precisely what President Eisenhower warned us against. The picture at top of President Eisenhower speaking from the Oval Office on January 17, 1961, is from the Associated Press. 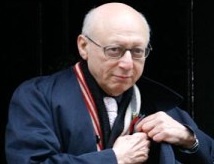 Sir Gerald Kaufman is consistently honest about the Palestinians. I would only quibble with has assessment of the scope of the issue — 7 million Palestinians are being penalized through also the denial of right of return, and discrimination in Israel. Thanks, Jim! What a dastardly, hypocritical, contextless two minutes by a sitting US lawmaker — this rascal Roskam. I am appalled, and we should all be ashamed for the America that could be. As you write and Roskam acknowledged, M. Oren has his Zionist hand in this affair; I expect it is also tied to the just-prior effort by a New York State congressman (Klein?) to pillory and punish the ASA. That effort, while intelligent and sane folk in NYS’s second legislative chamber have seemingly seen fit to draw back from it, has now been elevated to Roskam’s campaign encompassing all 50 states. We may be sure that he is basking in the glow of congratulations and solidarity (and the glint of gold via political contributions?) by the ubiquitous Zionist forces always avid to defend the indefensible. Thanks, Jim. Understanding a problem is the first step towards finding a solution for it. Unless people start dealing with this issue the way the Israel lobby does—that is using money to have politicians vote their way, I don’t think very much will change. In our political system, it’s the power of money that rules the system. More of a plutocracy than a democracy. We need to get the bribery out of our political system. As you have indicated, the “military-industrial-Congressional” issue is a hugely hazardous problem for our country. If we are against bribery and cannot counter the “bribe” money that the PAC’s give to our Senators and Congress men and women, the alternative is to organize some “Shame Campaigns” to shame the politicians, and those who bribe them, every time they speak, appear, or seek election. But, first, as you have demonstrated, one has to spread awareness to the max. We also could use a coinable phrase to inject into the “shame campaign”. Yes, let’s bring them shame and de-legitimize their crooked campaign. Although I continue to seek to influence my (New Jersey) senators and representatives, it takes incredible determination. I suspect that the real breakthrough will come from the doves inside Israel. Certainly there is some movement there. We also need to encourage American Jews who see through AIPAC. Our voices may be discounted, but their’s are heard.